About 50 people gathered from home (Tohoku, Tokyo, Osaka) and abroad (Sweden, US, China), and shared their thoughts and ideas on rebuilding Tohoku. Before KIBOW Shichigahama event, 10 KIBOW team participated in Sendai Bay Shichigahama Triathlon. Amid the cheers from local residents, the team swam and ran through the devastated town, Shichigahama. The 3 top teams which Tagajo High School ‘s track team runners anchored, were placed 5th, 6th, and 7th! 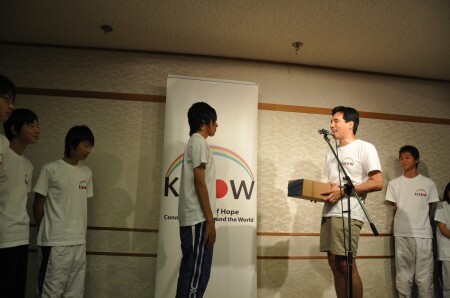 At the opening of the KIBOW event, running shoes and book cards were presented to the 7 high school students. Thank you very much for the donation given through Just Giving and Mizuno. After the presentation ceremony, participants enjoyed networking in a casual atmosphere. Dried laver of Shichigahama’s Hoshi Nori and natural seaweed and salt from Shiogama Shiogama Moshio was sold at the site to contribute to local operations. 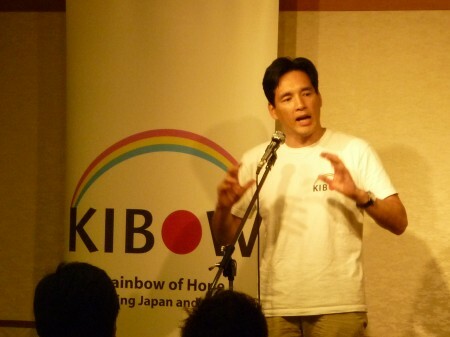 At the end, powerful speeches were given by the participants who are energetically and continuously giving their best efforts to rebuilding Tohoku.